Favoured by seasonal sartorialists for creating striking combinations in and out of the office. The Sublte Blue Check shirt is a playful way to introduce some contrast into your seasonal layers. Woven with a smooth subtle prince of wales check, the pattern is perfect for complementing statement suits or dappering up your weekend denim. Go tonal and match with navy hues or add a flash of blue for a little extra pop. 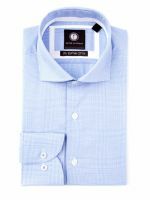 Our collection of men’s dress and casual shirts are fashioned from 2-ply Egyptian cotton, formed from the rich soil and moist atmosphere facilitated by the Nile River. This adaptable weave gives our shirts a softer and more lustrous finish unparalleled by any other shirting cotton. Easy Care, Easy Iron, Wrinkle Reduction.